Speech and Language Technologies, Designing interfaces for the low-literate, Telephone-based Speech Interfaces for Access to Information by Non-literate Users, Speech Recognition. Mr. Agha Ali Raza is a Fulbright Scholar who has a PhD from the Language Technologies Institute, School of Computer Science at Carnegie Mellon University, Pittsburgh, USA. 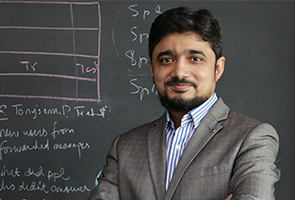 He received his Master of Computer Science and Bachelor of Computer Science degrees from FAST-NU, Lahore. He has several years of teaching experience as a member of the Computer Science permanent faculty at FAST-NU. His research interests include Speech-based Human Computer Interfaces, telephone-based automated dialog systems, Information & Communication Technologies for Development (ICT4D) and Natural Language Processing with a focus on the use of Speech & Language Technologies for Development. He has authored/co-authored more than 11 research papers in peer-reviewed conferences. The aim of his current research is to enable dissemination of speech-based, development-related information and communication services to low-literate telephone users throughout the developing world; without the benefit of explicit user training. His work shows that speech-based simple entertainment services can be used as powerful motivators to induce self-training and viral spread among low-literate masses. Such services can further be used as vehicles for delivering core development services and as experimental test-beds for performing randomized controlled trials and demographic studies. His recent work on Polly won the best paper award at CHI-2013 conference. Yibin Lin, Agha Ali Raza, Jay-Yoon Lee, Danai Koutra, Roni Rosenfeld and Christos Faloutsos, Influence Propagation: Patterns, Model and a CaseStudy, in PAKDD2014, the 18th Pacific-Asia Conference on Knowledge Discovery and Data Mining, May 13-16, 2014, Tainan, Taiwan. Haohan Wang, Agha Ali Raza, Yibin Lin and Roni Rosenfeld, Behavior Analysis of Low-literate Users of a Viral Speech-based Telephone Service, in Proceedings of the 4th Annual Symposium on Computing for Development, ACM DEV-4. December 6-7, 2013, Cape Town, South Africa. (CHI Best Paper Award) Agha Ali Raza, Farhan Ul Haq, Zain Tariq, Mansoor Pervaiz, Samia Razaq, Umar Saif and Roni Rosenfeld, Job Opportunities through Entertainment: Virally Spread Speech-Based Services for Low-Literate Users, in Proceedings of the 2013 ACM SIGCHI Conference on Human Factors in Computing Systems. April 27-May 2, 2013, Paris, France. Agha Ali Raza, Farhan Ul Haq, Zain Tariq, Umar Saif and Roni Rosenfeld, Spread and Sustainability: The Geography and Economics of Speech-Based Services. In Proceedings of ACM DEV, January 11-12, 2013, Bangalore, India. Agha Ali Raza, Mansoor Pervaiz, Christina Milo, Samia Razaq, Guy Alster, Jahanzeb Sherwani, Umar Saif, and Roni Rosenfeld. Viral entertainment as a vehicle for disseminating speech-based services to low-literate users. In Proceedings of the Fifth International Conference on Information and Communication Technologies and Development, March 12-15, 2012, Atlanta, Georgia, USA. Agha Ali Raza, Sarmad Hussain, Huda Sarfraz, Inam Ullah, Zahid Sarfraz, An ASR System for Spontaneous Urdu Speech, in the Oriental COCOSDA 2010 conference, Nov. 24-25, 2010, Katmandu, Nepal. Huda Sarfraz, Sarmad Hussain, Riffat Bokhari, Agha Ali Raza, Inam Ullah, Zahid Sarfraz, Sophia Pervez, Asad Mustafa, Iqra Javed, Rahila Parveen, Speech Corpus Development for a Speaker Independent Spontaneous Urdu Speech Recognition System, in the Oriental COCOSDA 2010 conference, Nov. 24-25, 2010, Katmandu, Nepal. Huda Sarfraz, Sarmad Hussain, Riffat Bokhari, Agha Ali Raza, Inam Ullah, Zahid Sarfraz, Sophia Pervez, Asad Mustafa, Iqra Javed, Rahila Parveen, Large Vocabulary Continuous Speech Recognition for Urdu, in International conference on the Frontiers of Information Technologies, December 21-23, 2010, Islamabad, Pakistan. Agha Ali Raza, Sarmad Hussain, Huda Sarfraz, Inam Ullah, Zahid Sarfraz, An ASR System for Spontaneous Urdu Speech, NU Graduate Colloquium on Computer Sciences (GCCS), 30 Jan 2010, Department of Computer Science, FAST National University, Lahore, Pakistan. Agha Ali Raza, Master of Science (Computer Science) thesis on Design and Development of an Automatic Speech Recognition System for Urdu, June 2009. Agha Ali Raza, Sarmad Hussain, Huda Sarfraz, Inam Ullah, Zahid Sarfraz, Design and development of phonetically rich Urdu speech corpus, Proceedings of O-COCOSDA'09 and IEEE Xplore; O-COCOSDA'09, 10-13 Aug 2009, School of Information Science and Engineering of Xinjiang University, Urumqi, China. Agha Ali Raza, Awais Athar, and Sajid Nadeem, N-GRAM Based Authorship Attribution in Urdu Poetry, Proceedings of the Conference on Language and Technology 2009 (CLT09), Lahore, Pakistan, Jan 2009. Agha Ali Raza, Zulfiqar Habib, Manabu Sakai Interpolation with rational cubic spirals, Proceedings of the 4th IEEE International Conference on Emerging Technologies (IEEE Catalog No. CFP08617, ISBN: 978-1-4244-2211-1, Library of Congress: 2008901427), Rawalpindi, Pakistan, Oct. 2008. Agha Ali Raza, Asma Zaib, Sana Altaf, Zulfiqar Habib, On a Special case of path planning, Proceedings of the 7th CIIT Workshop on Research in Computing (ISBN: 978-969-8779-18-4), Lahore, Pakistan, June 2008.